Follicular units are distinct groupings of usually one to four terminal hairs.The follicular unit is thus a naturally occuring physiologic, as well as an anatomic entity. Patient (KM) received 2300 grafts to his hairline, frontal area, and fronto-temporal corners using the FUE (Follicular Unit Extraction) method. After photo was taken at 6 month follow up. 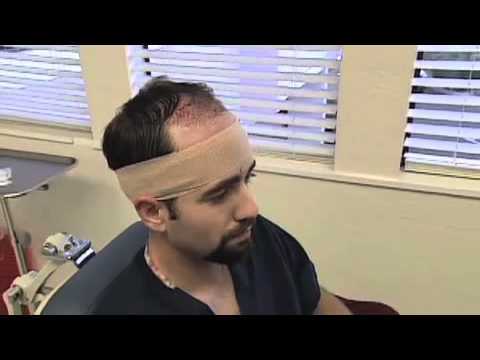 Follicular unit transplantation offers the surgeon the ability to transplant the maximum amount of hair with the minimum amount of non-hair bearing skin. Although, it is hard to argue the superiority of the follicular unit technique in theory, in practice, follicular unit transplantation is tedious, demanding on the physician and staff, and requires a relatively high degree of expertise to be properly performed. Dr. Wasserbauer has been fellowship trained in this surgical technique and is skilled in both the surgical and technical tasks.